• What year did your Company/Business/Farm get started? • What kinds of products/produce/merchandise do you sell/grow/distribute? What brands? We provide facilities and supplies for car washing. Visit us at 904 D. Street in Madera. • Who is the target audience for your Company/Business/Farm? For example: Children, Farmers, Dairymen, Low Income, Schools, Everyone, etc. All residents in the county and city of Madera. 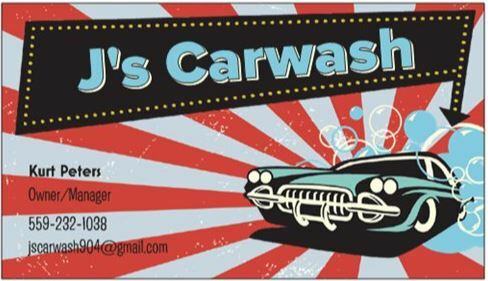 Everyone wants a clean car at a great price. • Are you part of a family owned business? Which family members help run the business? This is a family run & owned operation. Kurt Peters’ father started it years ago and now Kurt runs it and Jennifer does the bookkeeping. • What changes have you made in your business to stay up to date with current trends? For example: new products, today’s youth, the green movement, alternative sources of power, advertising strategy, etc. We are looking to put in a reclamation system in our current facility and building a second location as well. We changed all lighting to LED. We have updated all of our equipment: vacuums, pump and materials to be more ecofriendly and energy efficient. • Are you concerned with the water issues that we face in the Central Valley? What are your specific concerns? Being a carwash, water is essential to our business. • Length of Madera County Farm Bureau membership?